The company that operates a wind farm in West Pubnico where a turbine caught fire and burned Friday is investigating the cause of the blaze. The fire broke out shortly after 4 p.m. Friday at the Pubnico Point Wind Energy Center, owned by Nextera Energy Resources. Firefighters were at the scene quickly but could do little to battle the flames, West Pubnico fire Chief Gordon Amiro said. When the blades turn, the tips are more than 100 metres in the air – too high to fight the fire from the ground. “A landowner contacted our wind site manager about the fire, who in turn contacted the local fire department to secure the site,” Nextera Energy spokesperson Bryan Garner said in an email Monday. He said an investigation into what caused the fire has begun. Two of the turbine’s blades were completely burned and the nacelle, the gearbox at the centre of the blades that’s “almost as big as a school bus,” was also seriously damaged, Amiro said. 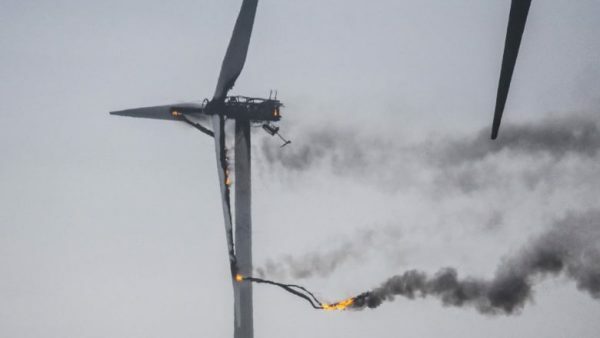 According to a July 2014 study by the Imperial College of Science, Technology and Medicine in London, England, wind turbines may catch fire because their design puts highly flammable materials, such as hydraulic oil and plastic, in close proximity to machinery and electrical wires.